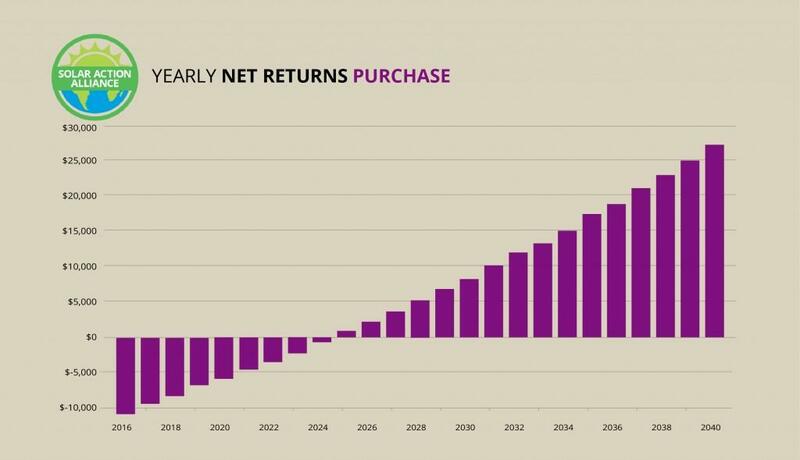 According to the Swanson effect in the graph below, the price of Crystalline silicon or wafer-based solar panel cells is decreasing rapidly and predictably and at present rates, costs reduce by 20% every ten years. 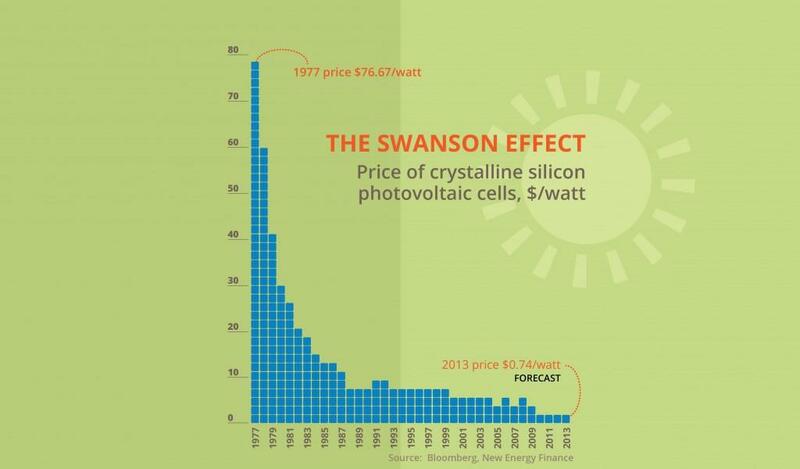 Using Swanson’s Law, we see that the cost of solar panels fell from $76.67 per watt in 1977 to $0.36 in 2014. Tied for 18th in the 2016 solar report card, Nevada is making some terrific efforts at becoming a leading state in solar and renewable energy production. With the huge expanses of desert, the dry air and the plentiful sunshine, Nevada has almost perfect conditions for generating solar energy. With the amazing lights and casinos in Nevada, the energy needs are expanding daily. 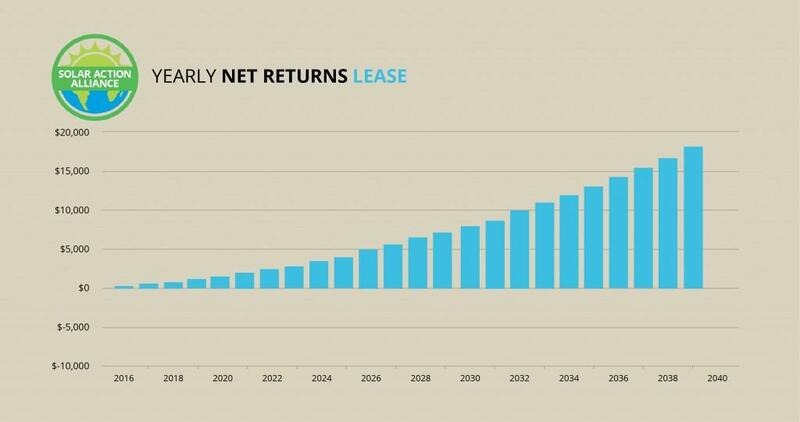 As the below Swanson graph shows, as the cost of solar has dropped dramatically, it is now incredibly affordable and cost-effective to install and use solar panels in Nevada. Let’s take a look at some of the great solar panel installation options available in Nevada. 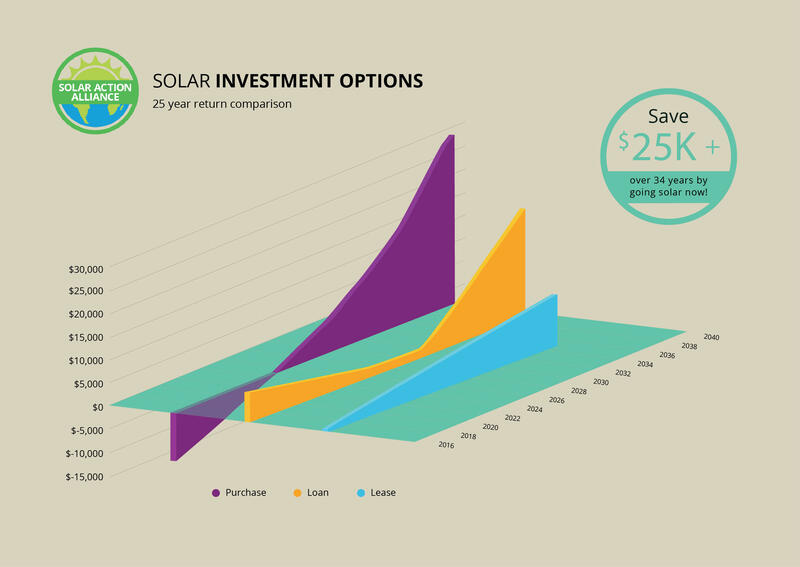 The chart below gives you an idea of the costs and returns for each solar option available to Nevada residents – purchase, purchase with credit, and solar leasing. One important thing to note from the chart below: solar panels in Nevada makes you money. Unlike states with weaker solar programs and lower energy costs, Nevada can actually makes you money right away. A cash purchase always delivers the most immediate, largest savings. With no loan payments, you realize 100% of the energy savings immediately, along with the Federal 30% tax credit. Considering an average purchase price of $25,000 for a 5kW system, you will receive a Federal tax credit of $6900 (30% on the net cost), after your state rebate of $2000 ($400/kW). Your first-year investment is only around $16,100! Your energy savings the first year should be around $936. Taking into account energy cost inflation, your system should pay for itself in around 10 years, and by year 25, you should see a net profit of around $21,000! Not a bad return, and remember that you are helping to provide good-paying, local jobs and save the environment. For most people, paying for solar with a home equity loan makes the most sense. Because you are using a home equity loan, you not only get the 30% Federal credit, but you can deduct the interest on the loan as well. You get all of the benefits and incentives without any cash out of pocket. Let’s assume a home equity loan of 5% for a $25,000 solar panel system. While there will be a few years in the beginning where the loan payments are greater than the savings in energy costs, energy inflation will quickly outpace your loan payment. With an average $25,000 installation price, a purchase on credit makes perfect financial sense. Year one, you should have about $936 in energy costs, and have loan payments totaling about $2182. This means around $104 per month out of pocket your first year, but remember, you got $8900 in tax credits and rebates. That tax credit means you are $7654 ahead the first year! 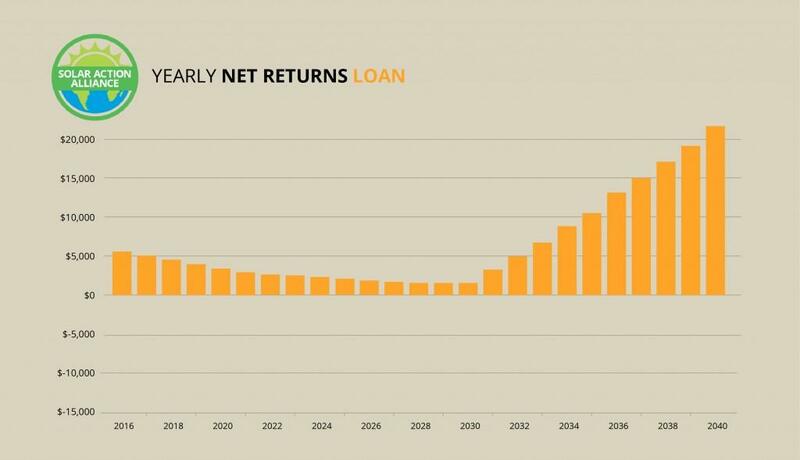 By year 15, when the loan is paid off, you will be realizing about $1300 per year in savings, and by year 25 your total net returns are around $18,000, even after paying off the system! If you would like a custom quote based on your energy use, click here for a quote. Solar leasing is a great way to go solar if you are short of cash or if you don’t have the ability to take a loan. As you can see above, the immediate returns are not as impressive, but due to Nevada energy costs and the normal energy cost inflation, your savings multiply year after year! In Nevada, you will start out with a relatively small savings of $33 per month, which multiplies over time, but you save this money with no money out of your pocket. With solar leasing, you generally have two distinct options. With standard leasing, you basically pay a rental payment for a solar roof system. The system is installed and maintained by the solar company on your roof. Depending on the amount of sun you get, the lease payment plus the new, lower electric bill should be less than what you are currently paying. With a Power Purchase Agreement (PPA), you agree to allow a company to install home solar on your roof. You then purchase the energy your panels produce at a substantial discount to your current residential electric rates. As with a lease, the company maintains the system and assumes all risk. You just collect the savings. Keep in mind that with a lease, you do not get the residual value of the system to your property, as you do not own it. You also do not receive any of the tax credits or other benefits of home solar ownership, other than lower energy costs. 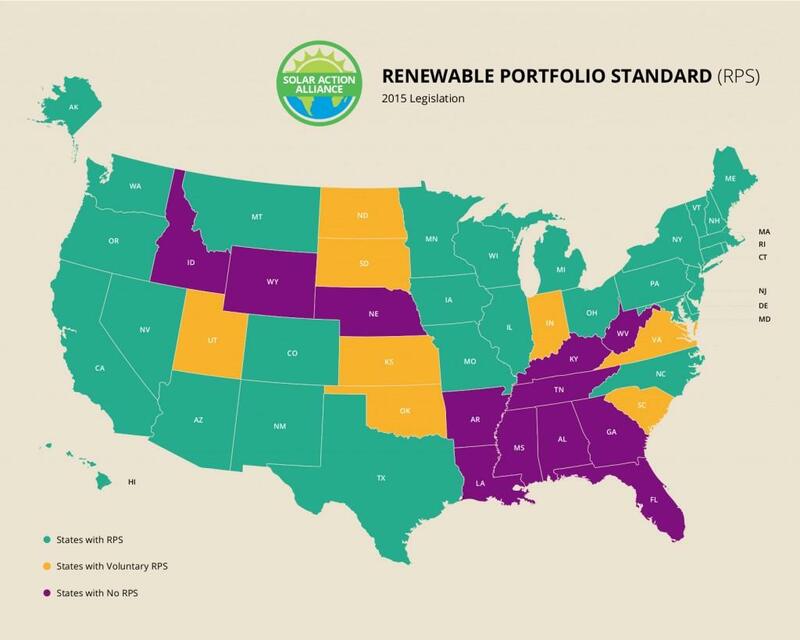 A state’s Renewable Portfolio Standard (RPS) is a plan, based on legislation or regulation, that outlines goals and targets for production of renewable energy in the state. The RPS is the tool that encourages power companies to supply renewable energy rather than using fossil fuels. Though there are some states with stronger RPS guidelines, Nevada, at 18th in the nation, is pretty strong, with a mandate of almost 25% of electricity generated by renewables by year 2025. That’s pretty great! Nevada has a solar “carve-out”, but it mainly deals with commercial solar generators, not home solar. 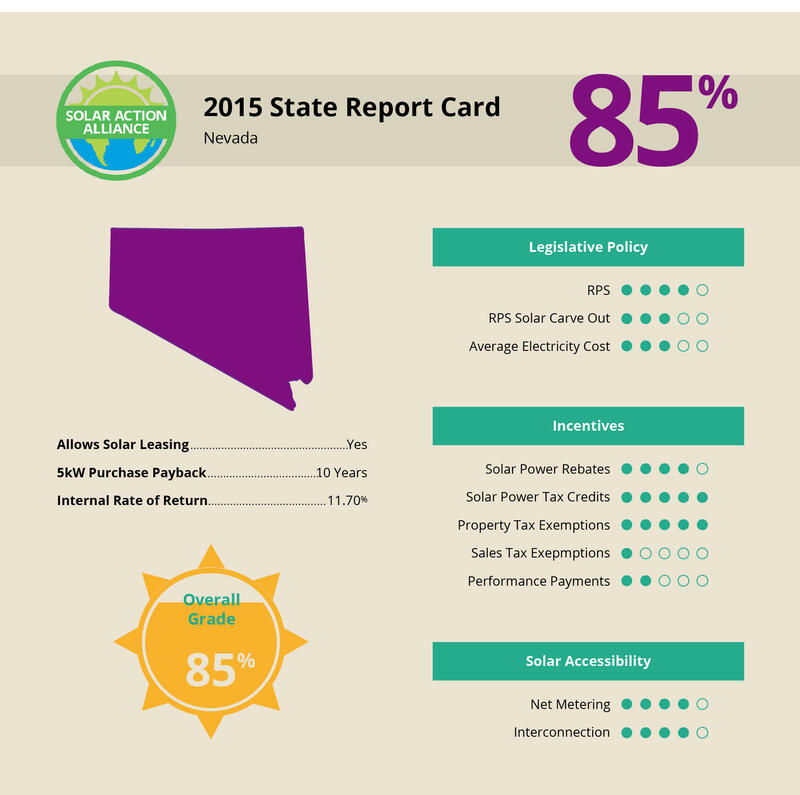 Luckily, moving forward, Nevada is mandating a 25% carve-out for residential solar. Nevada has no property tax exemption for the value of home solar systems. You are taxed for the increased property value of adding solar to your home. Not exempting solar discourages participation. Nevada has no sales tax exemption for solar. Many states exempt home solar from state sales tax, further reducing the actual cost of the system. Nevada charges state tax on solar. This is a very easy, inexpensive change that would greatly increase participation. Nevada, after struggling with some weak and ineffective rebate programs in the past, has finally come forward with some strong incentives for purchasing solar. There are some pretty terrific solar performance payments called “PECs”, that you are allowed to sell back to your utility for the excess power you produce. These payments, in place until at least 2025, mean about $450 per year for a 5 kW solar panel system. Net metering requires each utility to monitor how much energy is produced, and to credit you for any excess over what you use. Nevada has excellent net metering laws, crediting each surplus to the next utility bill indefinitely or allowing some customers to receive the surplus as an annual payment. Nevada is making a true effort to be one of the leading solar energy providers in the US. With ideal climate and progressive laws and regulations, the state is becoming very friendly to both residential and commercial production of renewable energy. Join the 1000s we’ve helped switch to solar!